This mural focuses on the fiftieth anniversary of the CHLT-TV television channel (1956-2006). It highlights several artists of the regional cultural community. The spectator can recognize some well-known figures: TV, visual arts, dance, music personalities, and many others that stood out in an original way, on a local or international level, like Garou, an artist from Sherbrooke. 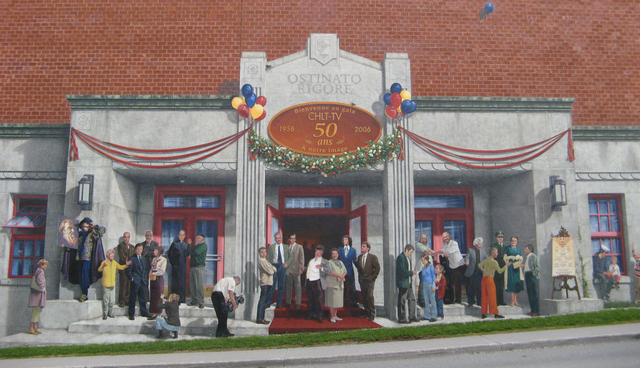 The mural shows a gala where around thirty guests of honour, from across fifty years of history, are gathered on a red carpet, at the entrance of a fictitious venue. CHLT-TV first settled at the corner of the Frontenac and Dufferin Streets in a building from 1887 (which still exists), an old place used for cultural purposes formerly named the Sherbrooke Library and Art Association. In the following video, one of the first artists of the Sherbrooke local television presents The old Soirée canadienne TV show and its host, Louis Bilodeau.